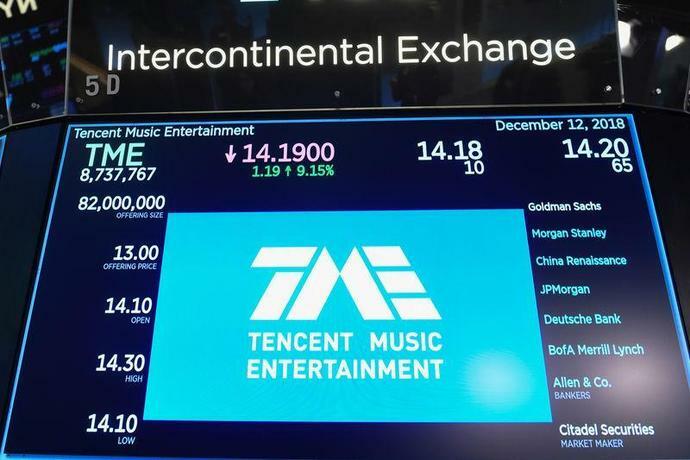 (Reuters) - China-based music streaming company Tencent Music Entertainment Group on Tuesday posted an in-line quarterly adjusted profit, in its first earnings report since going public. The company's shares, which have gained about 43 percent since their market debut in December, fell 6.3 percent to $17.36 in extended trading. Tencent Music, controlled by Chinese tech giant Tencent Holdings Ltd, said quarterly revenue jumped 50.5 percent to 5.4 billion yuan ($804.7 million), beating analysts' average estimate of 5.29 billion yuan. The company reported a net loss of 875 million yuan for the fourth quarter due to a one-off share-based accounting charge. Excluding items, the company earned 0.57 yuan per American depositary share, in line with analysts' average estimate, according to IBES data from Refinitiv. Tencent Music, in which its Swedish competitor Spotify Technology SA owns a stake, said full-year profit was 1.83 billion yuan. A combination of music and social features such as online karaoke and livestreaming, which are popular in China, has made Tencent Music more profitable than international peers.